How to create My Decision? How to create My/Their Decision? Click on the “Create Decision” button on “My Decisions Library” section to create a new decision. 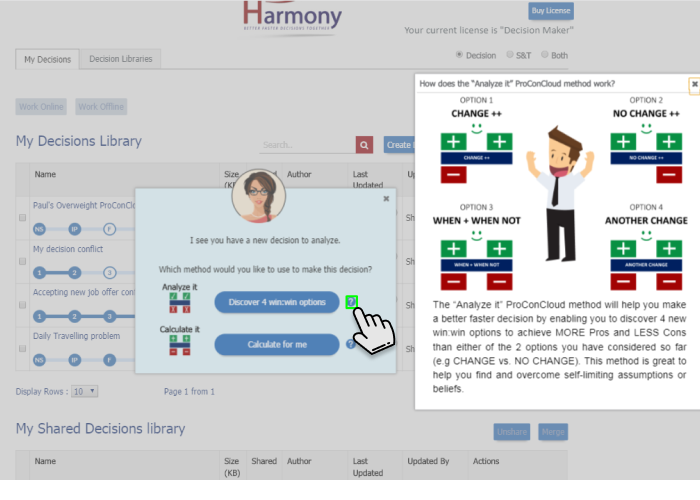 Harmony will ask you to select method (Analyze or Calculate method) using which you want to create a decision. Help icon will provide you details of each method. Harmony will ask you if you want assistance while creating decision. 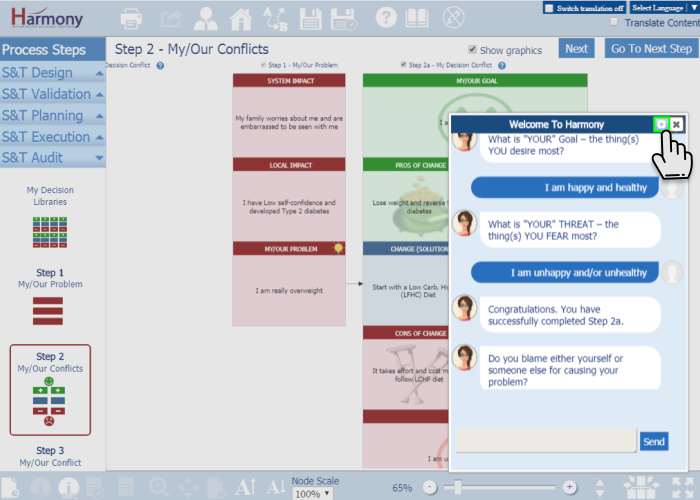 Harmony will ask you to input name of the decision you want to create. Once you input name decision will be created and you will be redirected to Step 1. 1. 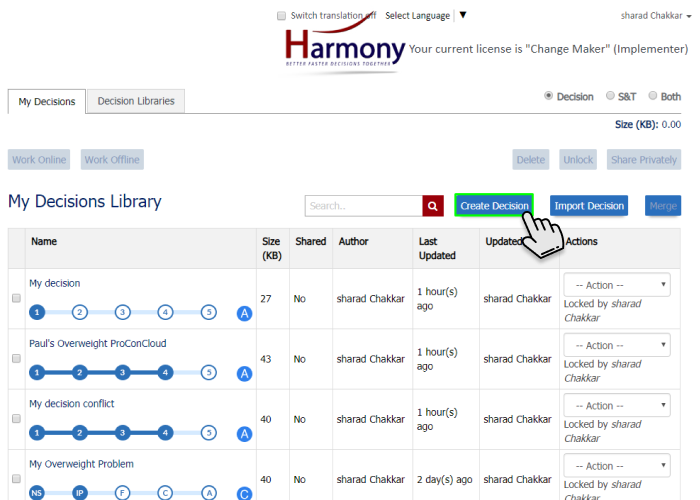 Click on the "Create Decision" button on "My Decisions Library" section to create a new decision. 2. 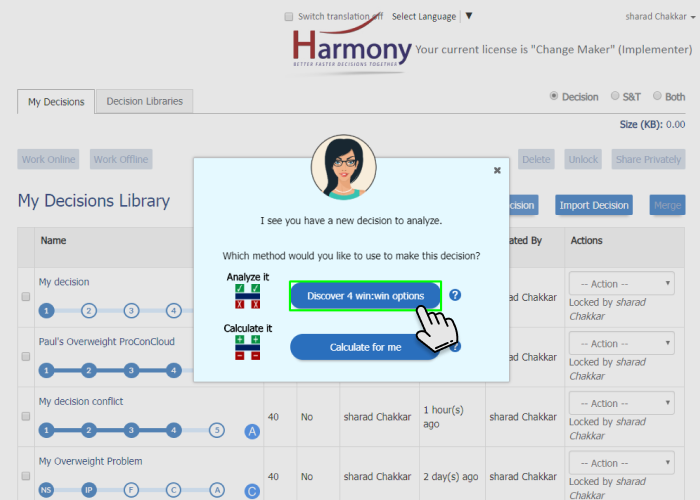 Harmony will ask you to select method (Analyze or Calculate method) using which you want to create a decision. 3. Help icon will provide you details of each method. 4. 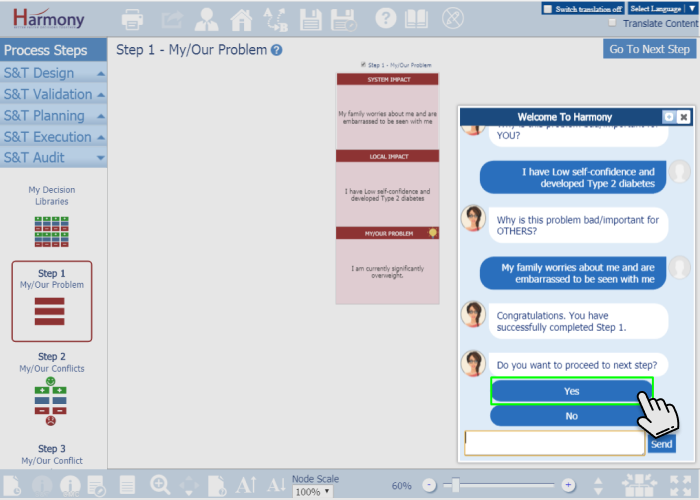 Harmony will ask you if you want assistance while creating decision. 5. 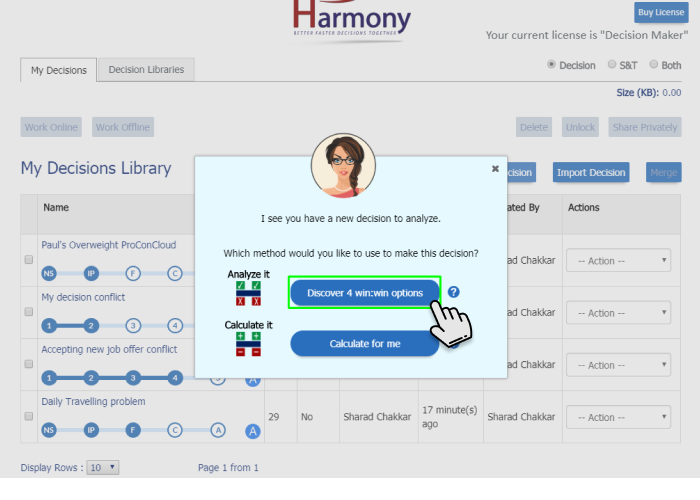 Harmony will ask you to input name of the decision you want to create. Once you input name decision will be created and you will be redirected to Step 1. 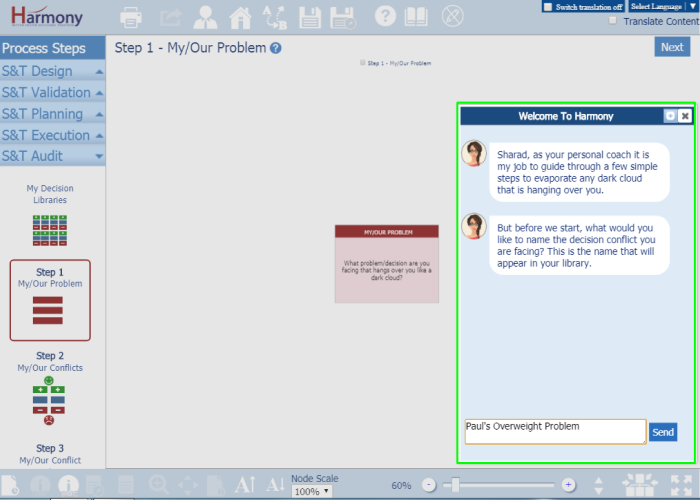 How to create My/Their Decision with Harmony Assistant? 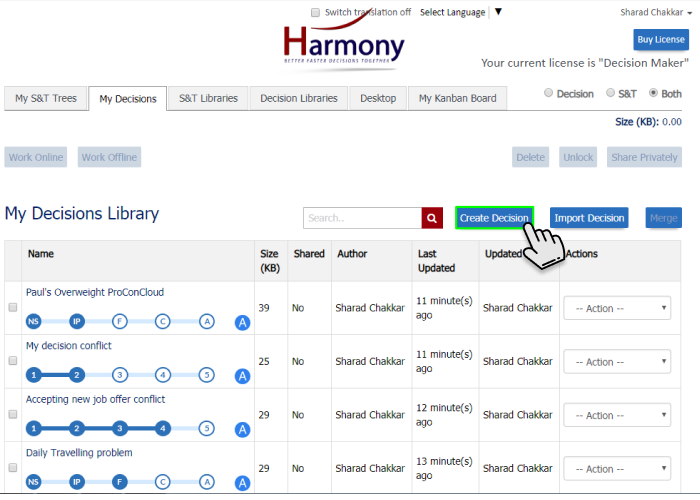 Once you select any one of the two methods, Harmony will ask you if you want assistance while creating decision. 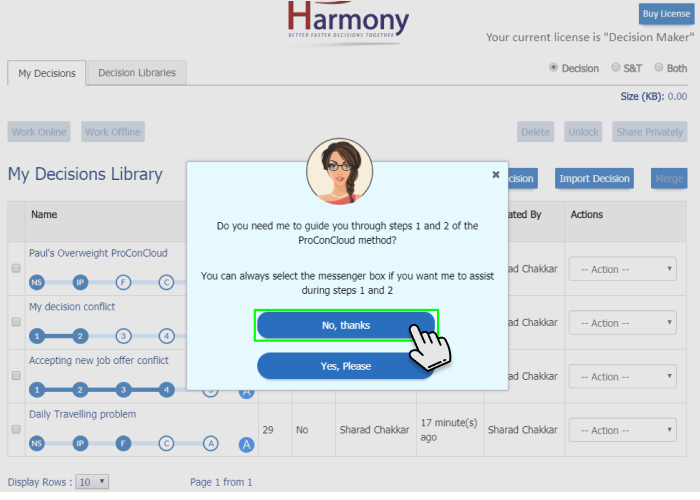 If you select “Yes”, you will be redirected to “Step 1”, with Harmony Assistant. Assistant will ask you to input your decision name. Then you will need to input YOUR Problem – an important problem you feel responsible for dealing with. Then you will need to answer “Why it’s bad for you?”. Assistant will ask you questions one by one. Once you input answers of all questions you will be asked if you want to proceed to next step i.e. Step 2. 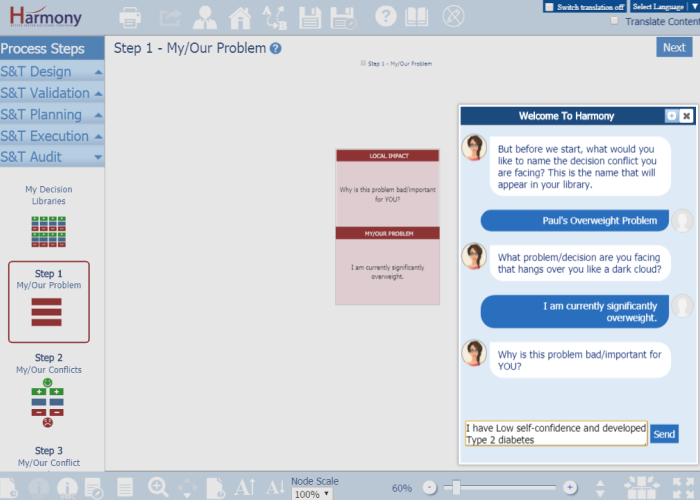 On Step 2, it will ask you first question for CHANGE “WHAT must YOU CHANGE to solve/better deal with your problem?”. You can also zoom the messenger by clicking on “+” icon. You can answer all the questions step by step and complete Step 2. You can minimize the messenger by clicking on “-” icon. 3. 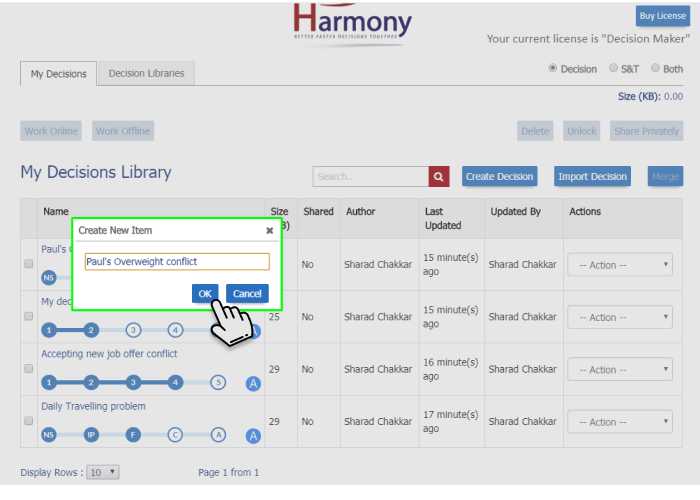 Once you select any one of the two methods, Harmony will ask you if you want assistance while creating decision. 4. 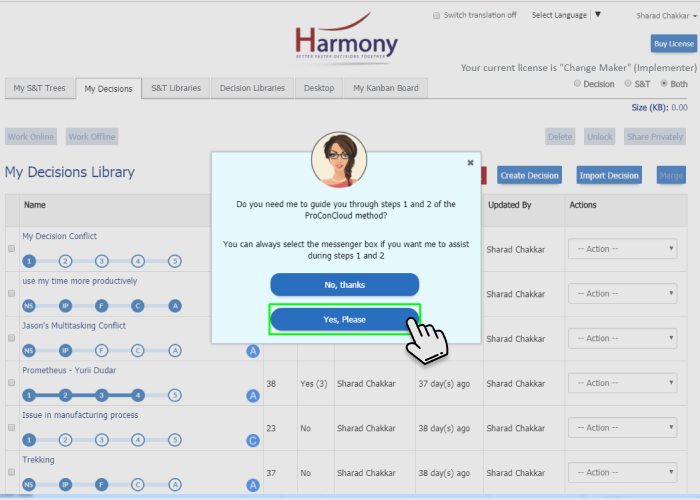 If you select "Yes", you will be redirected to "Step 1", with Harmony Assistant. Assistant will ask you to input your decision name. 5. You will need to input YOUR Problem – an important problem you feel responsible for dealing with. 6. Then you will need to answer “Why it’s bad for you?”. Assistant will ask you questions one by one. 7. Once you input answers of all questions you will be asked if you want to proceed to next step i.e. Step 2. 9. You can answer all the questions step by step and complete Step 2. You can also zoom the messenger.